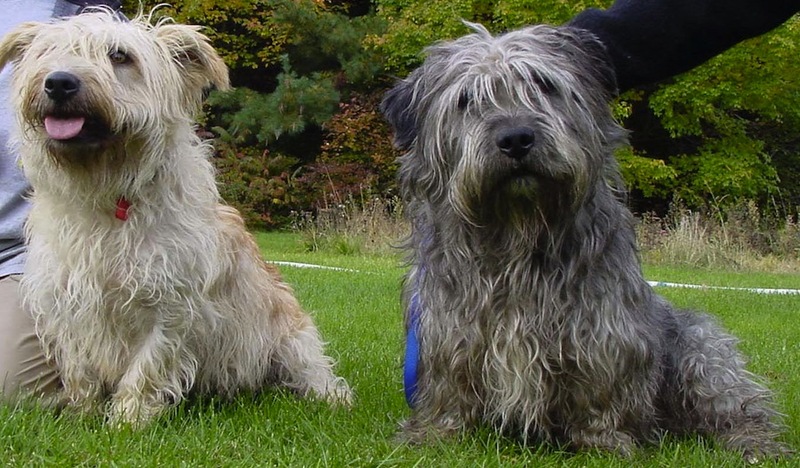 Glen of Imaal Terrier is considered a dwarf breed. Its body is more substantial and muscular than might be expected from its height, particularly compared to other small terriers; a typical adult Glen weighs about 36 pounds and stands 14″ tall at the withers. The AKC breed standard specifies a height of 12″ to 14″ and a weight of “approximately” 35 pounds for males and “somewhat less” for females, with a length-to-height ratio of 5:3. Many champion Glens are, however, larger than breed standard, with some individuals exceeding 40 or even 45 pounds. Glen of Imaal Terrier is a breed of dog of the terrier category and one of four Irish terrier breeds. It is sometimes called the Irish Glen of Imaal Terrier or the Wicklow Terrier, and the name of the breed is often shortened by fanciers to just Glen. The breed originates in the Glen of Imaal in County Wicklow, Ireland. The breed was recognized first by the Irish Kennel Club in 1934 and most recently by the American Kennel Club in 2004. The breed came into existence during the reign of Elizabeth I, who hired French and Hessian mercenaries to put down civil unrest in Ireland. After the conflict, many of these soldiers settled in the Wicklow area. They brought with them their low-slung hounds, which they bred with the local terrier stock, eventually resulting in a distinctive breed found only in the Glen of Imaal. Some say that the breed is related to the Soft-Coated Wheaten Terrier, another Irish terrier breed. The Glen of Imaal Terrier was developed as a general working dog for herding and for eradicating vermin such as fox, badger, and otter. When hunting, Glens work “mute to ground,” silently digging out their quarry, as they are a strong dog and not a sounding terrier. According to Irish lore, which is repeated in many descriptions of the breed including the AKC’s, Glen of Imaal Terriers were also used as turnspit dogs to turn meat over fires for cooking. The Glen of Imaal Terrier is one of the rarest breeds of dog (in the U.S., registered animals number about a thousand) and the least-known Irish terrier breed. Because much of the Glen of Imaal is now used as a firing range by the Irish army, today there are no Glen of Imaal Terriers residing in the Glen of Imaal. Glen of Imaal terriers are energetic and tenacious, although on the docile and quiet side for a terrier. Bred to be mute to ground, they are disqualified from trials if they sound at the quarry, and so are not as vocal as other terriers. Their deep and authoritative bark is similar to that of a larger dog, making them an excellent burglar deterrent. However, like other terrier breeds, these dogs can be stubborn; they are highly intelligent and require an owner with common sense to train them. Glen of Imaal terriers are typically fearless and loyal, and are superb with people, but can be aggressive if not properly trained, especially if provoked by other dogs. As a working terrier, their main function is to silently draw badger or fox from the Earth. They also can have an excellent nose and can be used to hunt vermin such as mink and rats. Although not typically strong swimmers, some individuals can work well in water. They do have a high prey drive and need to be properly socialized with other animals – particularly pets that they might mistake for prey, such as cats and rabbits, Some have been trained to herd and drive sheep and cattle. Share your Glen of Imaal Terrier story. Note: Upload only Glen of Imaal Terrier picture or your picture with Glen of Imaal Terrier below - spammer's ip may be blocked. A sturdy dog with strong working instincts, the Glen of Imaal Terrier has a rough-and-ready appearance that belies his calm disposition. The heavily muscled Glen is surprisingly fast and agile, spirited and playful. He likes vigorous games and long walks and must be on-leash or loosed in a safe, enclosed area, because he is a hunter and chaser. Indoors he wants to be near you — resting his head on your lap or feet — so is often underfoot. Yet his general nature is patient, laid-back, and undemanding, unusual for a terrier. Glens are polite with known visitors, but other dogs may be another matter. Early socialization and owner control and attentiveness are recommended. With his high prey drive, the Glen of Imaal Terrier must be carefully introduced to cats and should not be kept with rabbits or rodents. Glens have the stubborn character of a true terrier, but they are quite willing to work with you if you use praise and food to motivate them. With his enthusiasm, low center of gravity, and tremendous strength, the Glen of Imaal Terrier will tow you along the street unless you teach him how to walk on a leash. He is a powerful digger and has a surprisingly deep bark.